Soooo.... I actually started and erased this about 3 or 4 different times. Once was a story about a horse named Magnolia.... Then next was a fairy queen named Magnolia.... But I just couldn't get them to flesh out like I wanted them to. They felt too forced. So I thought and I thought and I though. Then it hit me! I've have always done so much better with free association!!! Horse - I have been on horseback exactly 2 times in my life. Neither time turned out well for for me.... Once I was bucked off and the other the horse took off in a gallop. I have since decided that horseback riding is NOT for me. Magnolia - I can remember being a little girl and climbing the magnolia tree in my grandmother's front yard. It was such a great climbing tree. My cousins and I would climb out on the big, low branch and hang upside down. Also - Steel Magnolias - One of my all time favorite movies ever! Guaranteed to always make me laugh and cry. Great, big, ugly, cry!!!! Friend - The best word in all of the English language. I been blessed with so many wonderful friends. So many kind, caring, wonderful women, have been there for me over the last 3 1/2 years. I will never ever be able to repay them all for the love and support they have given me. I feel so unworthy of it. I love you all! So very deeply! THANK YOU!!! Gilt - Shiny. Pretty. OOOOHH!!!! Beige - Now I am a lover of all colors....... EXCEPT...... Brown.... Beige.... I just can't..... 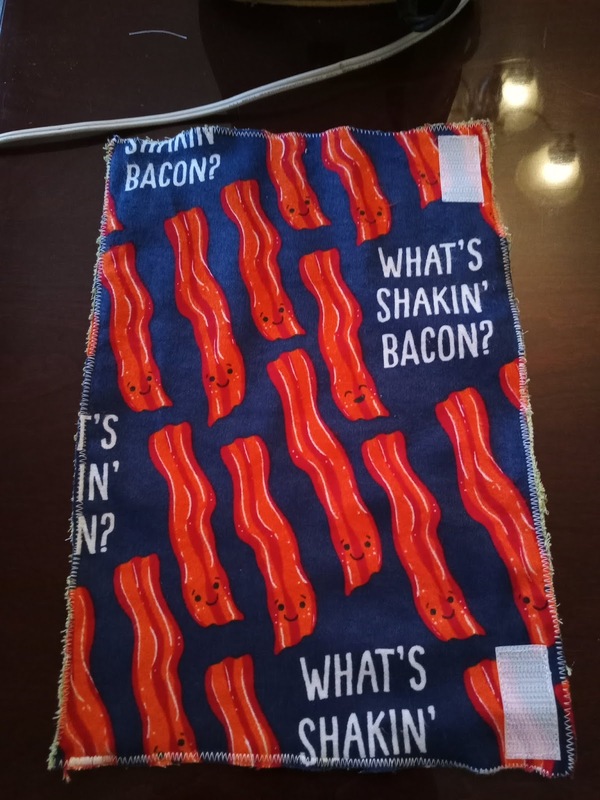 I don't know why. I can even do orange!!! But not beige.. There was a blouse I saw the other day that would have been SOOOOO CUTE had it not been beige gingham!!! BEIGE GINGHAM!!! GOOD GRIEF!! What is the world coming to when there's beige gingham??? I give up. I'm going to have to do better than free association soon! I'm going back to school in 6 weeks!! I'll be a college freshman at 45! Oh my...... And English Comp 101 is one of my courses. Ha ha!!!! Hey!!!! I'm back with a tutorial!!!! WOOOO HOOOO!!! It has a been a while!! About 3 1/2 years!! My goodness!!! I am so sorry. But life.... OH, BOY!!!!! Anyway, this one is quick, easy, and so much fun!!!! This will make 15 reusable kitchen towels. I cut them about 11.5 by 7.5. Cut the velcro strips into 1 1/4" pieces. You're going to need 30 of them. I put sides together before I cut so they'd be exactly the same cut. 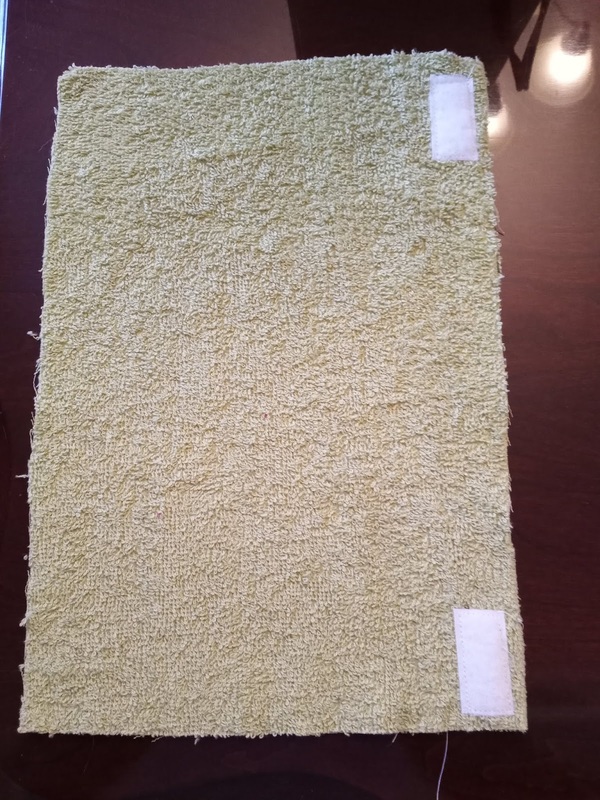 Sew the fuzzy, soft side of the velcro to the top and bottom corner of one side of the terry cloth, about 5/8" from the edge. 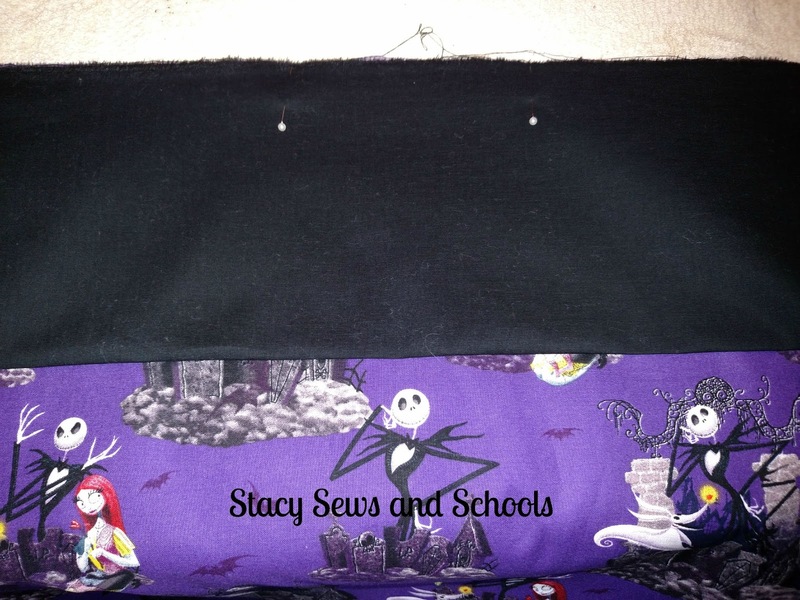 Sew the scratchy side of the velcro to the right side of the flannel, top and bottom corners, 5/8" from the edge. 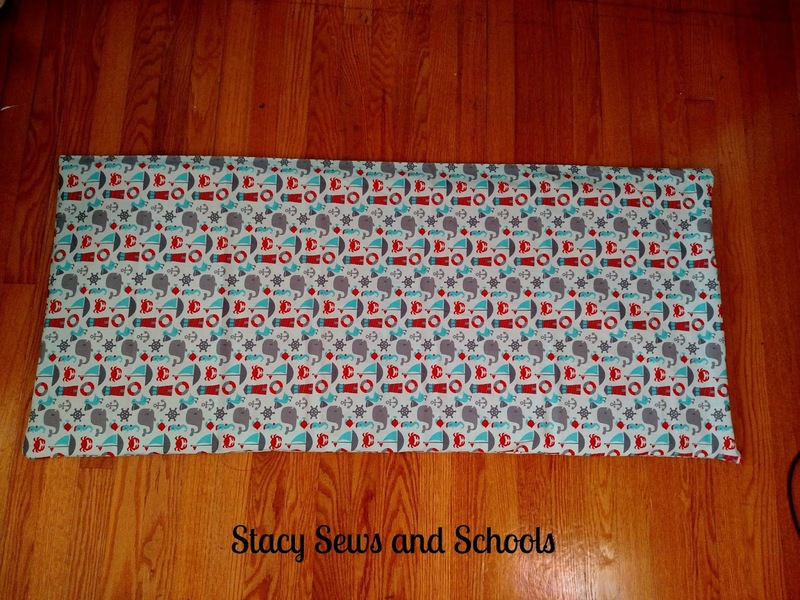 Wrong sides together, zigzag stitch along the outside edges. 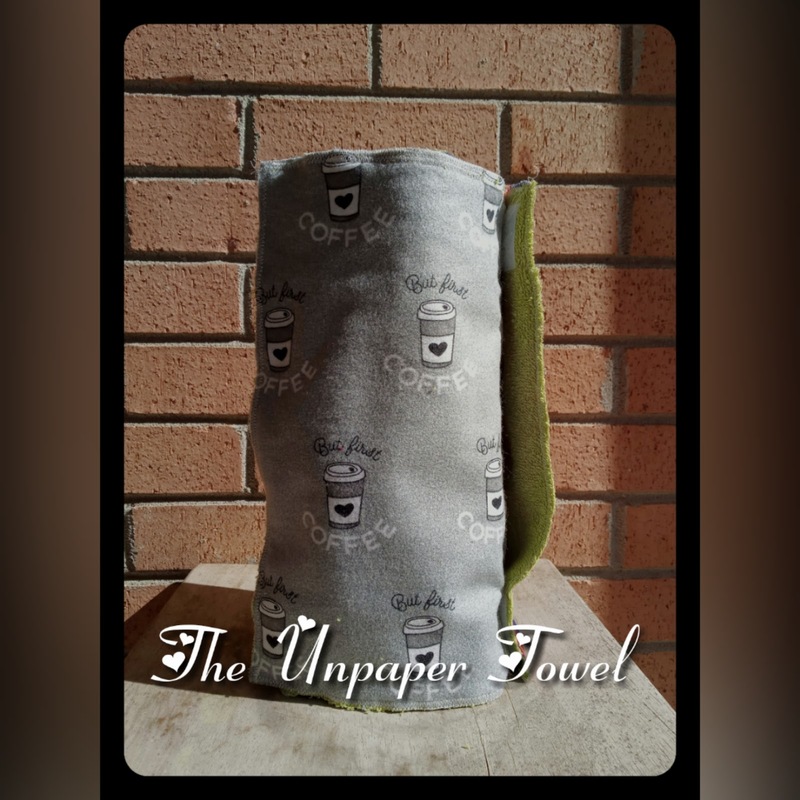 Repeat until you have 15 unpaper towels!!!!! 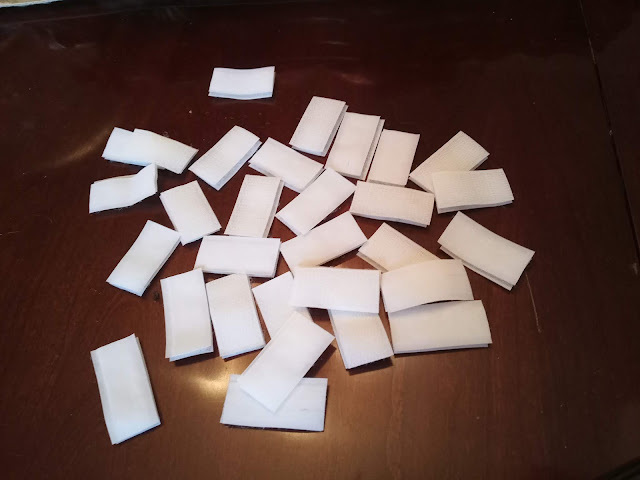 Then you just attach the velcro and roll them up. 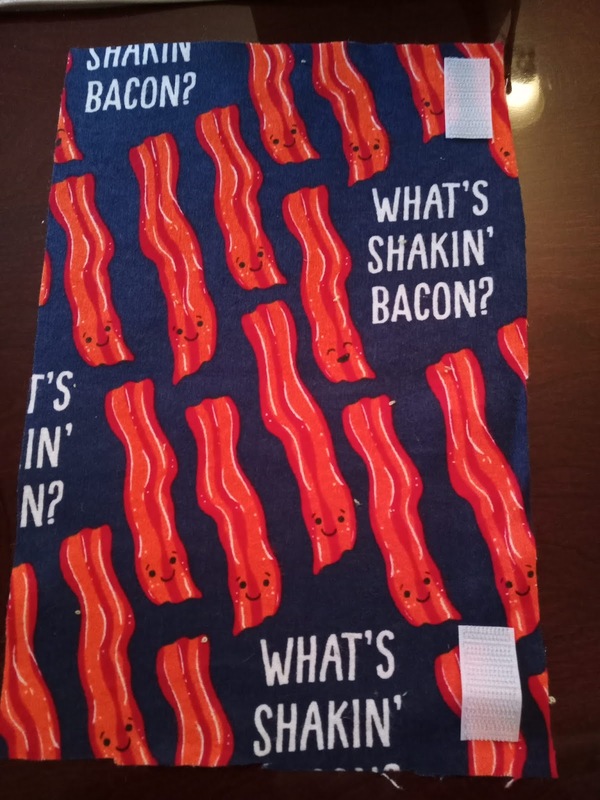 You can stand them on your counter or put them on your paper towel holder. I hope you enjoyed my little tutorial!!!! Now hop on over and check out all the wonderful things the other ladies have for you this month!!!! Welcome to a Secret Subject Swap. This week 10 brave bloggers picked a secret subject for someone else and were assigned a secret subject to interpret in their own style. 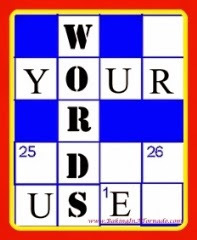 Today we are all simultaneously divulging our topics and submitting our posts. My subject is Finish this thought: the most annoying . . .
Ohhhhh, boy..... Do we have time for this???? Seriously, so many things seem to annoy me lately. Ha ha. Let me try to narrow it down. Ok. So the most annoying.... Trying to get my son to wear something other than his Deadpool onesie. He wears it to the store. He wears it to the movies. He wears it to the library. He even tried to wear it to church! I kid you not! I keep telling him that one day it's just going to fall right off him. I give him other options... Like his red Deadpool shirt. Or how about his yellow Deadpool shirt. Maybe the white Deadpool shirt??? See a theme here??? YILES!!! The boy is making me crazy. I guess I should be happy that he's at least wearing clothes. Right?? See you all again soon!!!!! I don't normally write serious posts. I don't usually touch on incendiary topics or anything that might be considered political. But I am now. Why now? Well, I have been seeing a lot of welfare bashing going across the interwebs. So now it’s OK to bully those in need? Do the people who say these things even have a clue of what it’s like to live in need? To be desperate? Here’s the truth as I know it. Because yes, I've lived it. I was a welfare child. Let’s start with getting on welfare to start with. You have to meet all kinds of requirements. If you don't have a job, you have to be actively seeking one unless you are disabled or in school full time. Most people on welfare are single parent families. They have children and/or the elderly. They are the disabled. They are NOT single, able bodied people. They can NOT buy anything with food stamps other than food. They can NOT use food stamps to buy toiletries, diapers, etc. See, that's the thing about welfare. Most people on it have NO OTHER CHOICE. They are not sitting around in the lap of luxury. They are just barely scraping by. BARELY. People wonder why there are so many homeless. Well, because it is NOT easy to actually get welfare. And after a certain amount of time with no job you get booted off. There is no further safety net for people on welfare. Got robbed? Sorry, can't help you further. Lost your stamps/money? Sorry, can't help you further. This is not a secret, there are all kinds of statistics that show these things, but people really don't want to listen for some reason. I don't get it. When people talk about getting rid of welfare all I can think about is what would have happened to me as a kid? To my family? What would happen to ALL those kids, the disabled, the elderly that rely on it so much? Those who, at a specific time of their life honestly and truly just need help? You don’t eat lunch after a certain grade because everyone knows who has free lunch and who doesn’t. 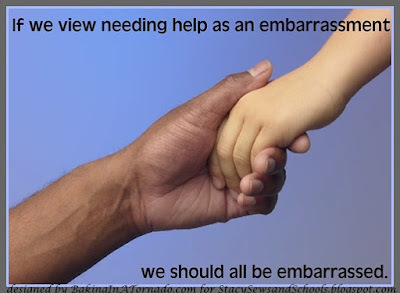 It’s hard enough being in middle and high school without adding any extra stigmas to yourself. You don’t get to participate in extracurricular activities. They cost too much and odds are your family may not have a car. Or they have a car but not enough money for gas. Going to the library to do research for school was difficult. Mom didn't have a car and there was no public transportation in my small town. Birthdays and Christmas can be very lean. I was lucky in that I had wonderful grandparents. But even then I can remember one particular birthday where the only thing I received was a pair of flip flops from Family Dollar. I’m not complaining. I know that I had it easier than most kids on welfare. I was born in 1974 so when I was on welfare they still had the booklet of stamps. EVERYONE in the store knew what they were and what they were for. It was very embarrassing. I didn’t have a VCR. I sometimes had very basic cable and sometimes a phone. I can remember one year, I was given a voucher for school clothes. I was so proud of those clothes! I was so very careful with them. Too bad there wasn’t also a voucher for school supplies. This was how I lived my life, this was my reality. I can remember right before I turned 18 my mom had been robbed and then went right into the hospital. Mom had a mental illness. In fact, she didn’t even realize she was robbed until sometime after the fact. There was no money, no food stamps and I was getting disconnect notices on the bills. I remember my friend’s wonderful mom bringing me over a box of food. I had to make decisions. Tough ones. Could I go to my grandmother and ask for money? I just couldn’t. My grandmother’s health wasn’t great, I was always afraid of upsetting her. And I knew I’d have to suffer the humiliation of going to her: my extended family would look even further down on me than they already did. So I started calling the utility companies. Thankfully they all gave extensions and I let my mom deal with it all when she got out of the hospital. I was so stressed and so scared. What were you doing when you were about to turn 18? Are there people who abuse the system? Yes, there are. But the vast majority do not. The actual amount of welfare fraud is extremely low because of all the documentation you are forced to present and hoops that you have to jump through. Not just to get on, but on a regular basis in order to stay on. But you know what? Even if the statistics on fraud were higher, I would still be all for it. I would MUCH rather my tax dollars go to feeding people than a bridge to nowhere, another war, another vacation for the fat cats who are trying to get rid of welfare. And because I believe in children. I believe that when a family is in need you do not kick them when they’re down. You help them back up. 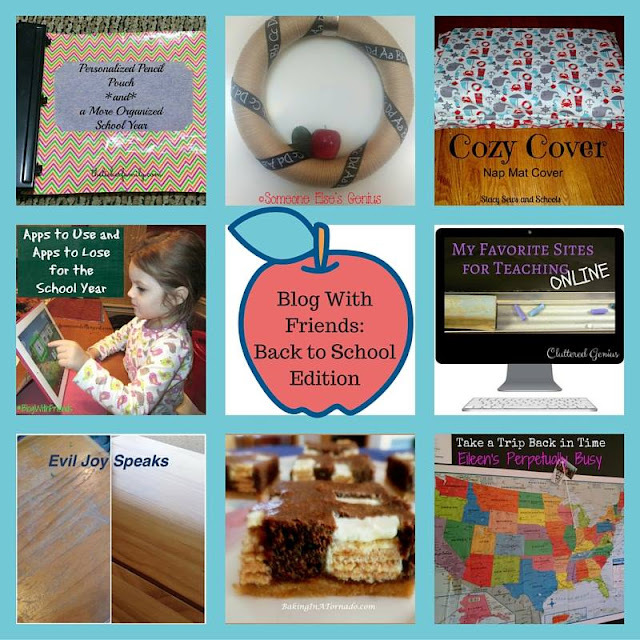 Today is Blog with Friends - SCARY STUFF Edition!!! Ready to be afraid???? 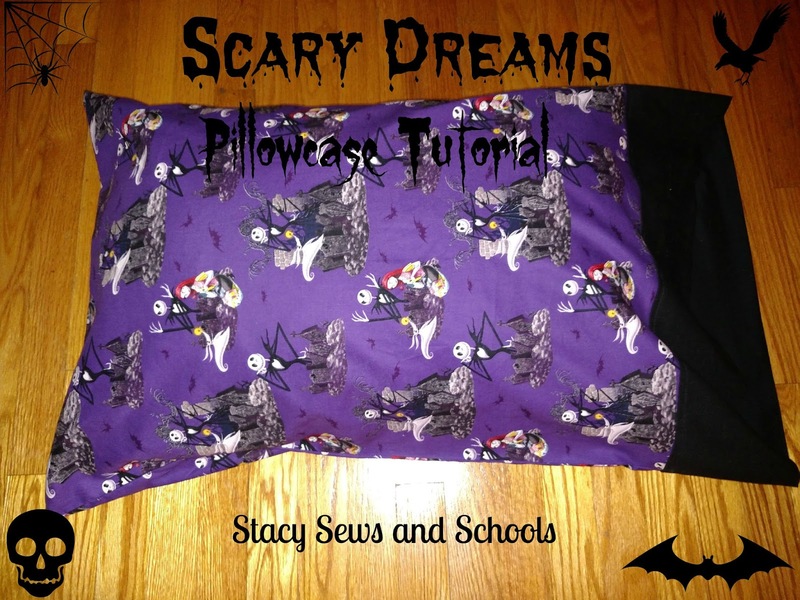 For my project I'll show you how to make a Have Scary Dreams Pillowcase! 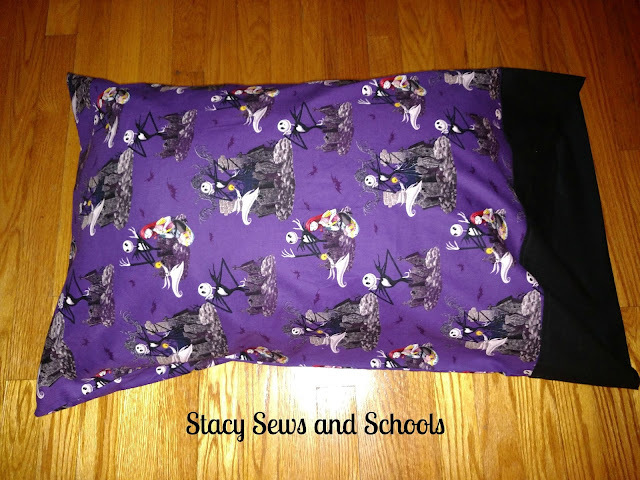 You can use an existing pillowcase to measure this out if you like. I cut it the length I wanted and left the width. 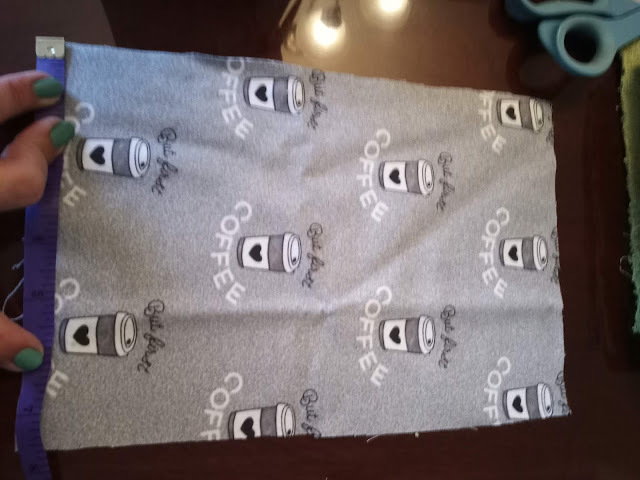 Fold the contrast fabric in half and press. Pin along the side and the bottom. Sew the seam and press! Guess what! You're done! That took, what?? 10 minutes???? I then took the pillowcase and embroidered Jacob's name on the black with shiny purple thread. 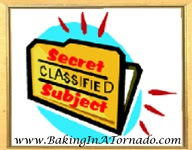 Karen of Baking In A Tornado shares a recipe for Billy the Puppet Cake. Robin of Someone Else's Genius wrote a Halloween story, In the End: Re-Imagined. Rabia of The Lieber Family Blog shows us how to make fun Trick or Treat Bags. Check out Lydia of A Cluttered Genius's Cheap and Easy Halloween Make-Up Tutorial. She had a large, robust family and she took great pride in it. Her children were her everything. Her reason to keep going in a difficult life. Being a mother was the most important thing in the world to her, her reason for being. Her reason for breathing. But things happen, like they always do. Her family was torn apart by a monster. She had to go. She took most of the children with her but one chose to remain behind. The pain in her heart from the one child deciding not to go with her nearly tore her heart in two. Her blue eyes were constantly swimming in tears. But she had to find the strength in her core to rise like a phoenix from the ashes of heartbreak, violence and betrayal. She had to keep going on the hope that one day all of her children would one day be under her roof, safe, sound and happy as they had never before been. 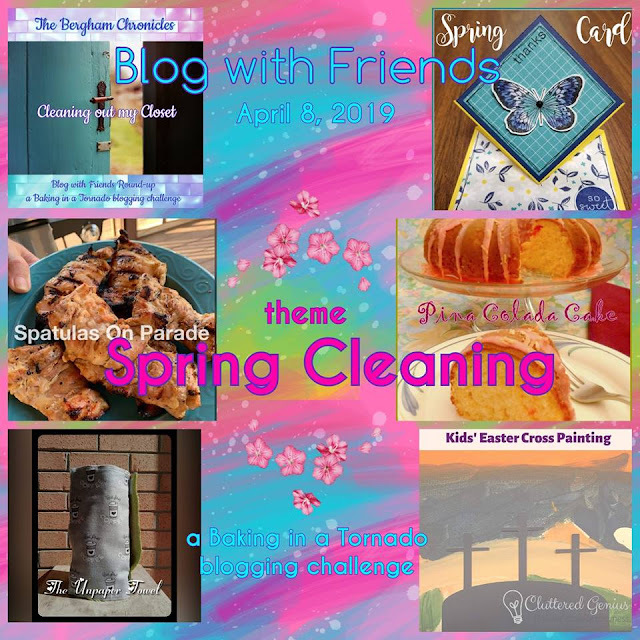 It's Blog with Friends time again!! WOO HOO!! I am so happy to be back with a new tutorial for you!! It feels like it has been AGES since I had a new tutorial!! I think the last one was a Blog with Friends! 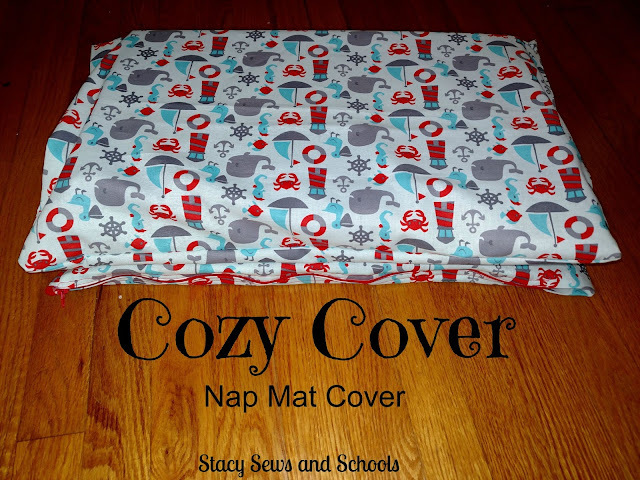 Anyway, this time around I have an easy peasy nap mat cover for you. Super fast, super easy!!! My cousin's little boy is starting preschool and they requested that the parents have covers for the kids' nap mats. 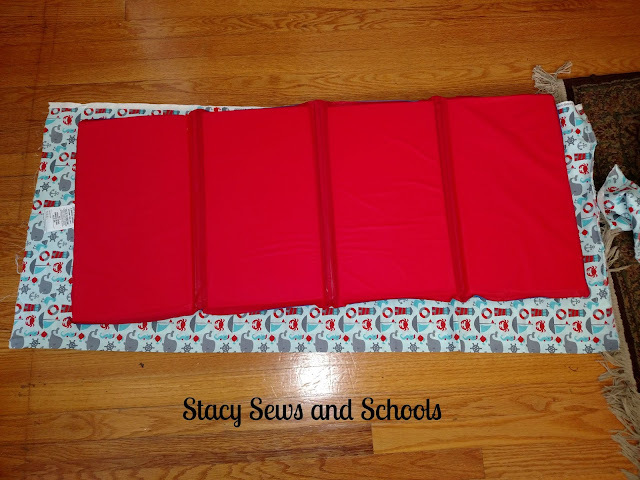 With the fabric folded in half, like it comes off the bolt, I put the nap mat on it and cut the fabric. 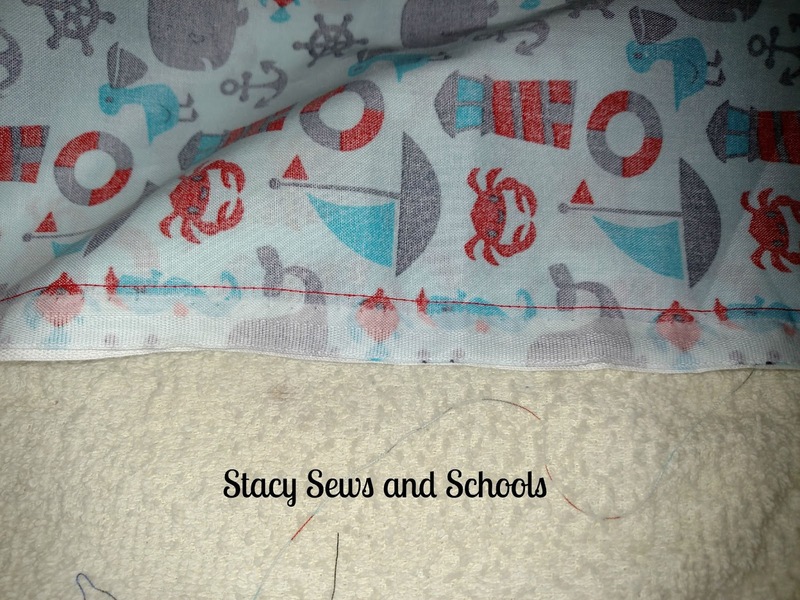 You want to leave several inches at the top and bottom as well as the sides for seam allowance, room for it to be folded, and room for it to spread out when the child lies down on it. 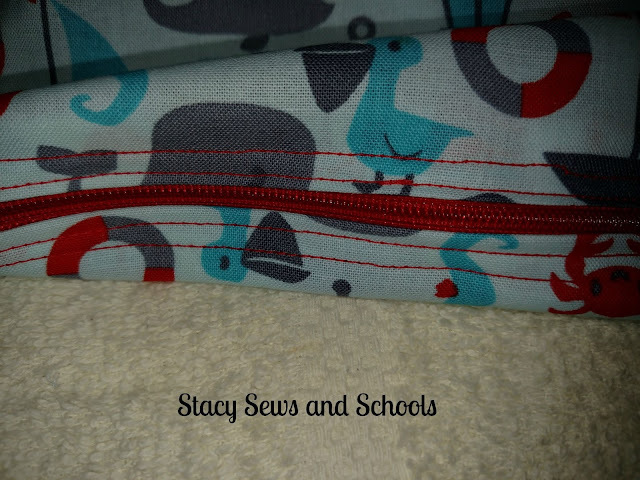 Sew the zipper in the top. I guess I'm a little rusty at this tutorial thing because this is the only picture I took of the zipper process. 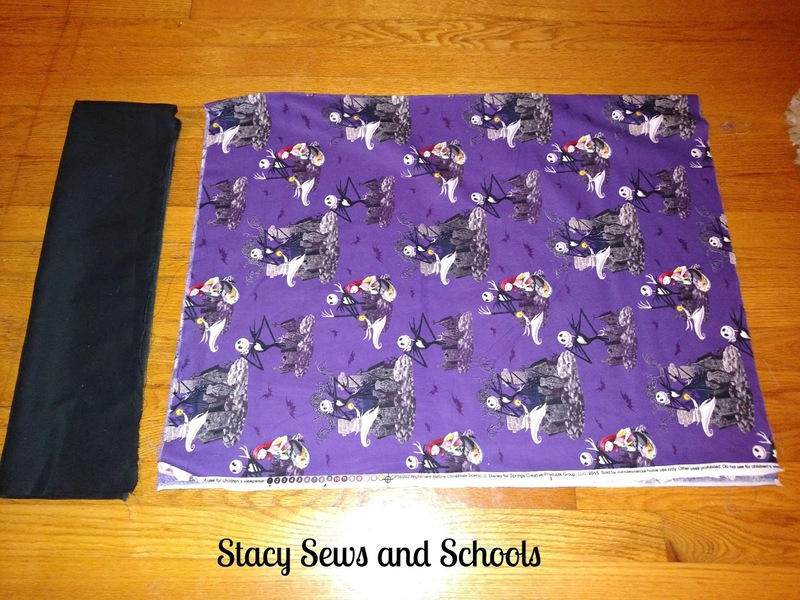 You are going to fold the fabric over at the top by 1/4" and press. Fold over 1/2" and press. 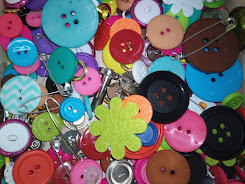 Place the zipper on the wrong side of the fabric and pin in place. I did a double row of stitches for reinforcement. With wrong sides together and your zipper open, sew the 2 open sides together. So, what do you think?? Fast and easy???? Don't forget to click the links to all the other posts!!! You know they're going to be AWESOME!!!!! 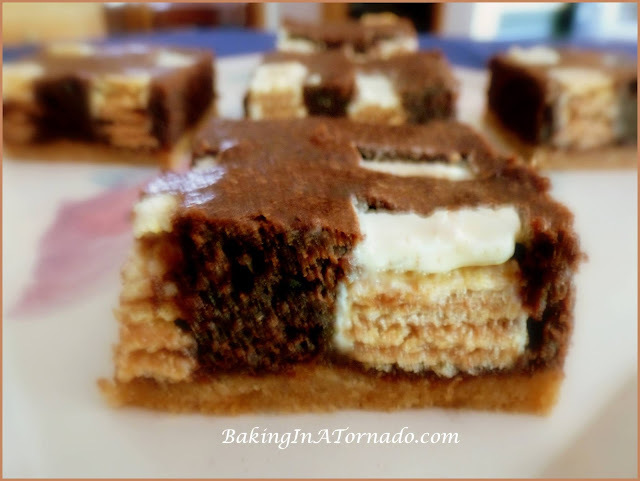 Karen at Baking in a Tornado has this DELICIOUS recipe for Kit Kat Brownie Bars. OMG!! I NEEEEED THESE!!!! Lydia from Cluttered Genius has the perfect list for you - Favorite Sites for Teaching Online. As a homeschooler this is AWESOME!!!! 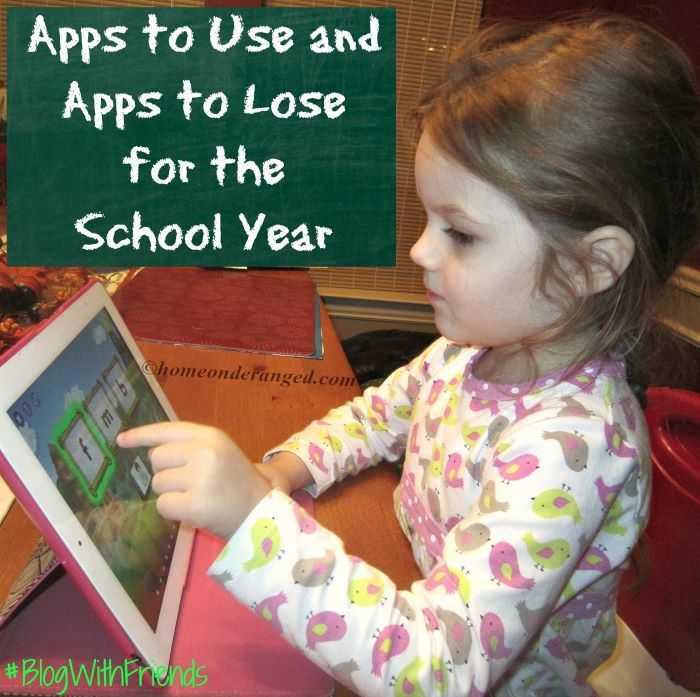 Melissa from Home on Deranged has a great post about Apps to Use and Apps to Lose for the School Year. 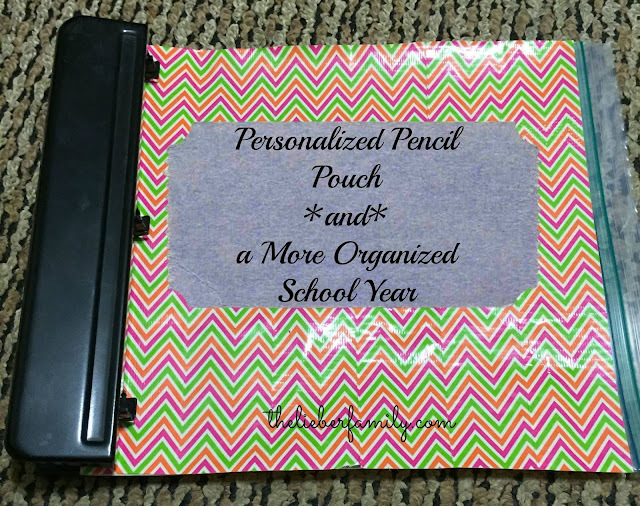 The Lieber Family has a great tutorial for making a Personalized Pencil Pouch AND a More Organized School Year. AWESOME!!!! 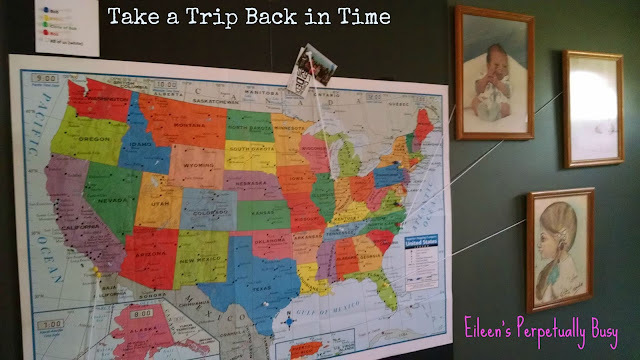 Eileen from Eileen's Perpetually Busy has a wonderful tutorial for making a special display for Take a Trip Back in Time. 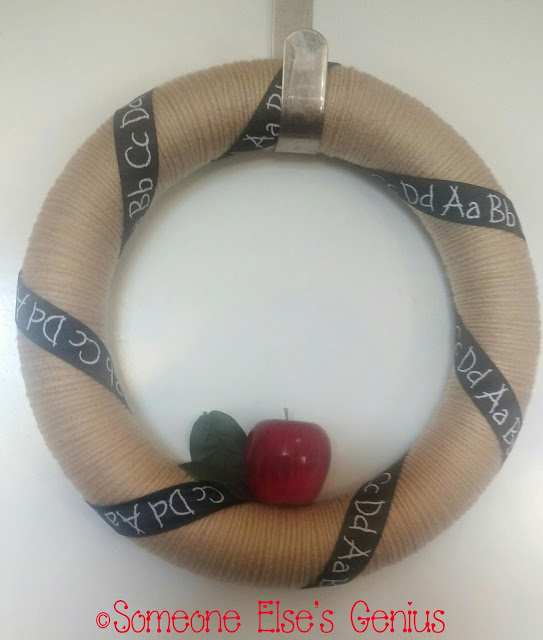 Robin from Someone Else's Genius has an awesome tutorial for this GORGEOUS Back to School Wreath! Love it! 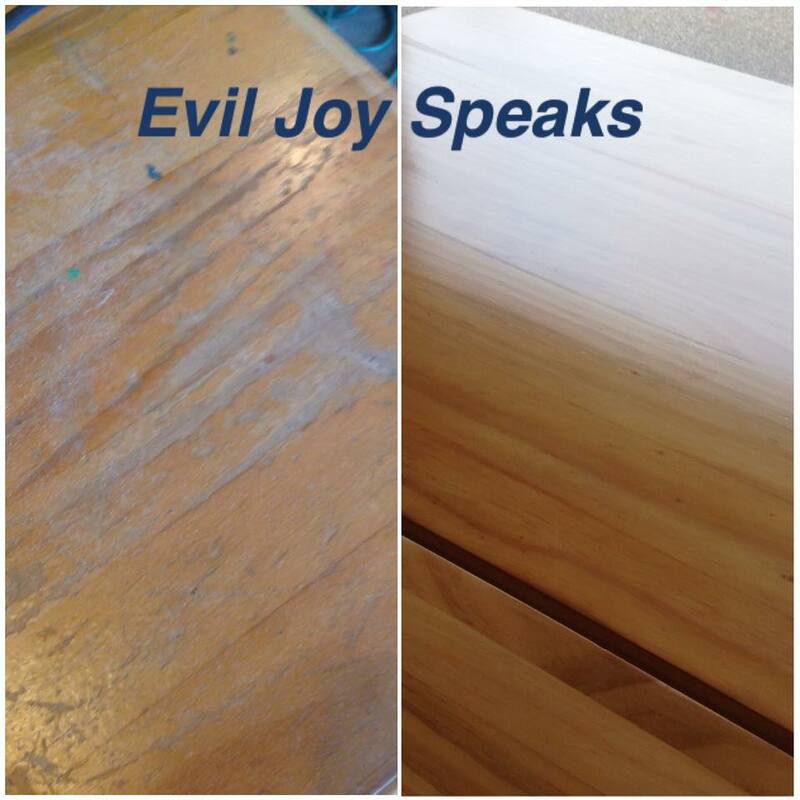 Joy at Evil Joy Speaks has a tutorial for a Back to School Homework Table! SO cool!!! Make sure you click on all the SUPER AWESOME links!!!! 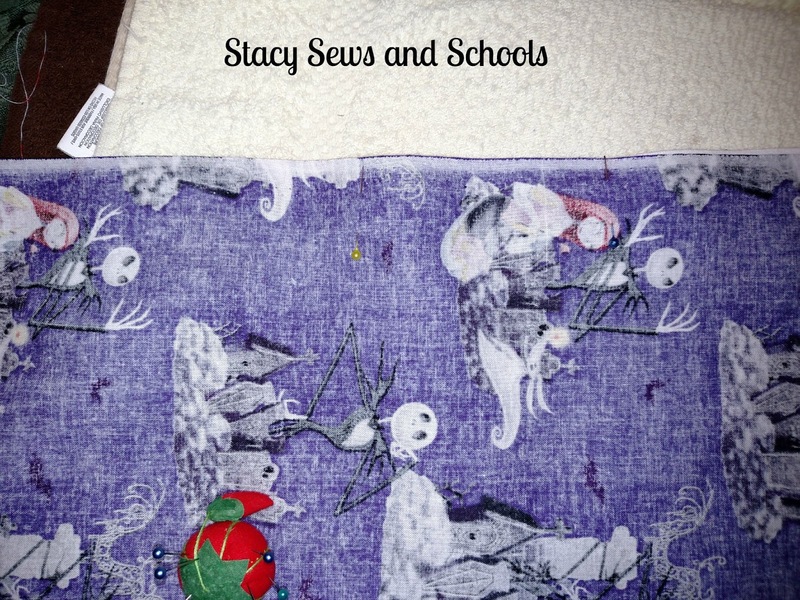 I received a sewing machine and instantly fell in love! 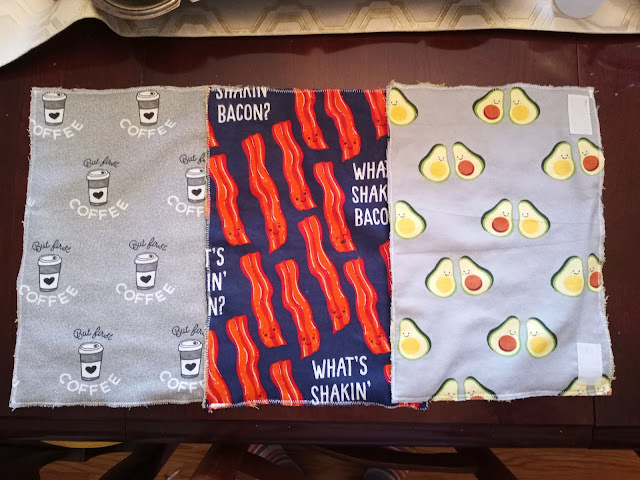 I am now a fabric junkie (and apparently a fabric pusher). I need a bumper sticker that says, "I'd Rather Be Sewing". I have 5 kids and homeschool 4 of them, one has already graduated. My mission: To document my sewing and homeschooling journeys and to help out others that are new to both. The craziness? That's just along for the ride. 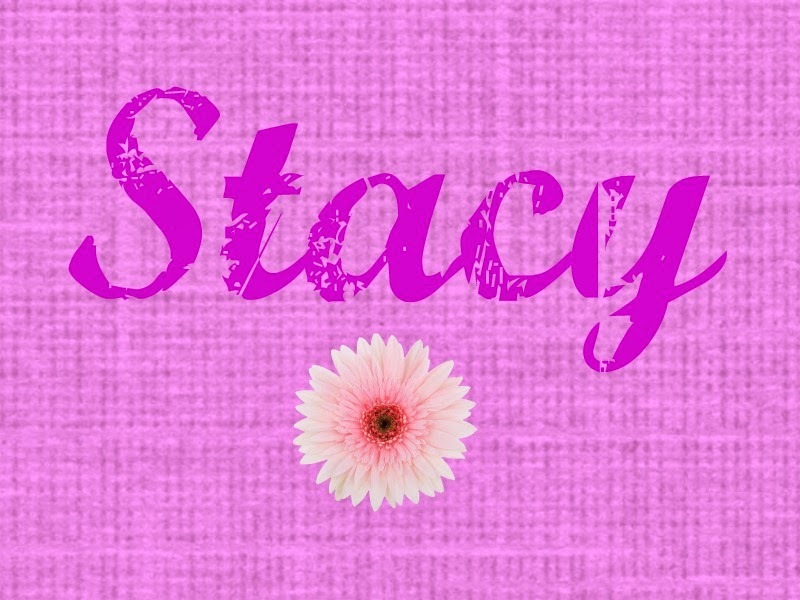 ©StacySewsandSchools. Ethereal theme. Powered by Blogger.